Weather you’re thinking Game Day, or Valentine’s Day, or just want to make any day special; you can’t go wrong with this moist and gooey Peanut Butter Fudge cake! A cake like this would make coming home from school a “special day” ! Combine flour, baking soda and sugar in a large mixing bowl and set aside. Melt the butter in a saucepan; stir in cocoa. Add water, buttermilk, and eggs, stirring well. Cook over medium heat, stirring constantly, until mixture boils. Remove from heat; add to flour mixture, stirring until smooth. Stir in vanilla. Spray a 13×9 baking pan with cooking spray and pour batter into pan. Bake at 350 degrees for 20 to 25 minutes, or until a wooden pick inserted in center comes out clean. Cool 10 minutes on a wire rack. Spoon small dollops of peanut butter on the warm cake and allow to melt slightly. Carefully spread over cake. Cool completely. Spread Chocolate Frosting over peanut butter and cut cake into squares. Bring butter cocoa, and buttermilk to a boil in a small sauce pan over medium heat, stirring constantly. Pour hot mixture over powdered sugar in a bowl, stirring until smooth. Stir in vanilla. Whoa Nellie, I’m making this for dinner! Thanks Kyra! My boss just sent me the link to your site because of this recipe. My husband and sons are going to looooove me this weekend. We’re a house full of chocolate and peanut butter fanatics! Thank you for sharing. Just letting you know, I DID already make this for dessert and it is so amazingly good. This recipe is now tagged with hearts all across the top of the page at our house. Thanks again. This cake is so good . . . thanks for the second witness Karen! Glad you loved it! Yum, this looks awesome! Thanks for sharing the recipe. I’m visiting from Tip Junkie Link Party. How can you go wrong with a chocolate peanut butter combo? Answer: you can’t! Honestly, I’m a cake mix kinda girl. But I love the idea of melting some peanut butter over a chocolate cake. 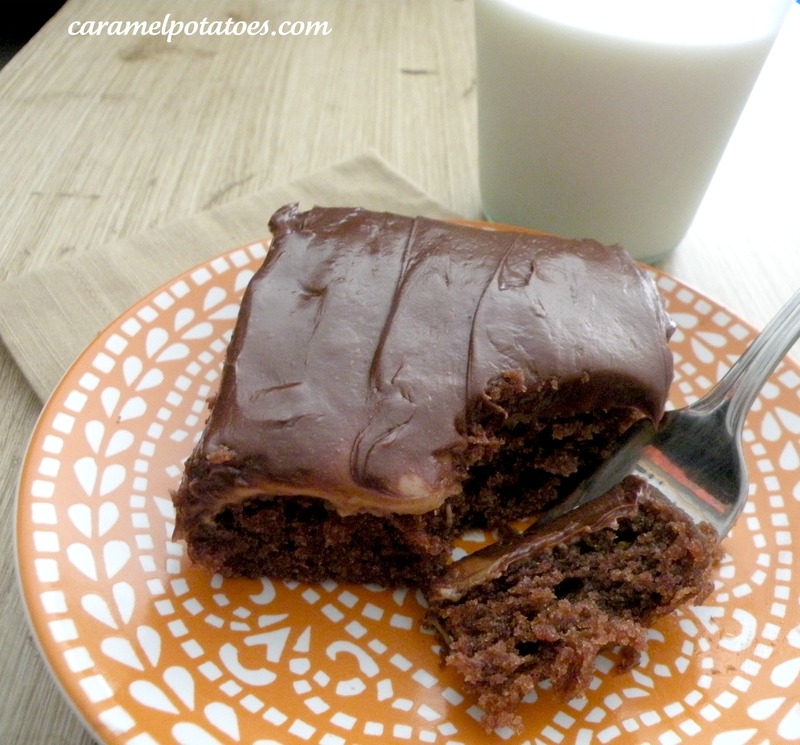 And topping with chocolate frosting – YUMM! Thanks for the inspiration!